After a long trip to a cold and and snowy Pennsylvania so that we could visit my family over spring break, I was beyond happy to return home to California, where the weather is warm, the sun is shining, and it actually feels like spring! But this warmer weather is a gentle reminder that summer isn’t far behind, and that means it’ll be long days spent in swimsuits and shorts. Time to crack down on my eating, hit the gym, and make my calories count. So I’ll be focusing on lowering my carbs, and getting in clean proteins, and lots of fruits and veggies. Stir fry recipes are a go-to for me anytime I want to find a delicious way to combine proteins and veggies. They are simple to make, and with the availability of pre-cut veggies at the grocery store, they can go from start to finish very quickly. Sometimes a simple stir fry recipe with just a few ingredients can end up being absolutely scrumptious. Such is the case with my Garlic Butter Shrimp and Zoodles recipe. I completely devoured this incredibly easy low calorie, low carb, keto-friendly, paleo-friendly recipe for lunch the other day, and couldn’t wait to share it! I really, REALLY wish I was one of those people who could get it together enough to meal prep for the week. I get so excited when I see pictures of beautifully stocked refrigerators, with meticulously organized stacks of pre-made meals. But I rarely have the time or patience to put those together for myself. My hours and days slip away from me quickly, and so I often need to rely on a solid arsenal of easy meals that I can cook quickly, if I want to enjoy a fresh, nutritious, low calorie lunch. 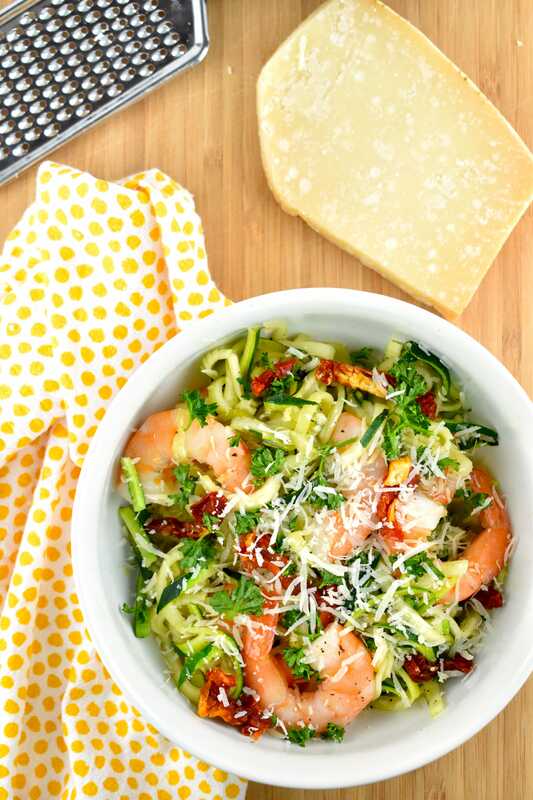 And I was able to throw together this shrimp and zoodles recipe in just about 15 minutes. In this dish, I opted to use zucchini noodles (often referred to as zoodles), instead of a high carb pasta or noodle. Zucchini noodles are very easy to make, and trust me when I tell you that you will become addicted to them. I am completely obsessed with swapping out regular pasta for zucchini noodles. And I am saving sooooooo many Points! If you haven’t got yourself a vegetable spiralizer yet, drop what you are doing and go buy one now. 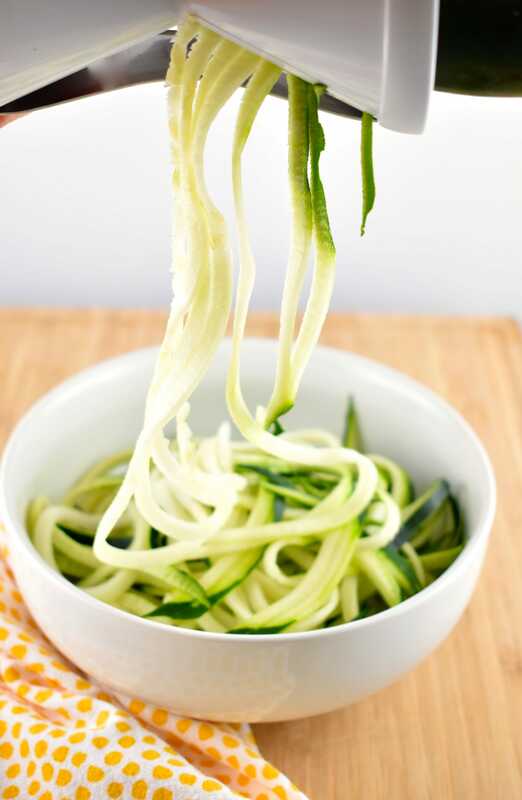 It is the easiest way to make zucchini noodles, and to spiralize other veggies too – you NEED one! The one I used is the Ontel Veggetti Spiral Vegetable Slicer. It’s small, so it doesn’t take up a lot of cabinet real estate in my kitchen, it’s very inexpensive, and it gets the job done beautifully with very little fuss. If you want something a little more fancy and capable of doing a few more tricks, this Sedhoom 4-Blade Vegetable Spiralizer is also a great option. 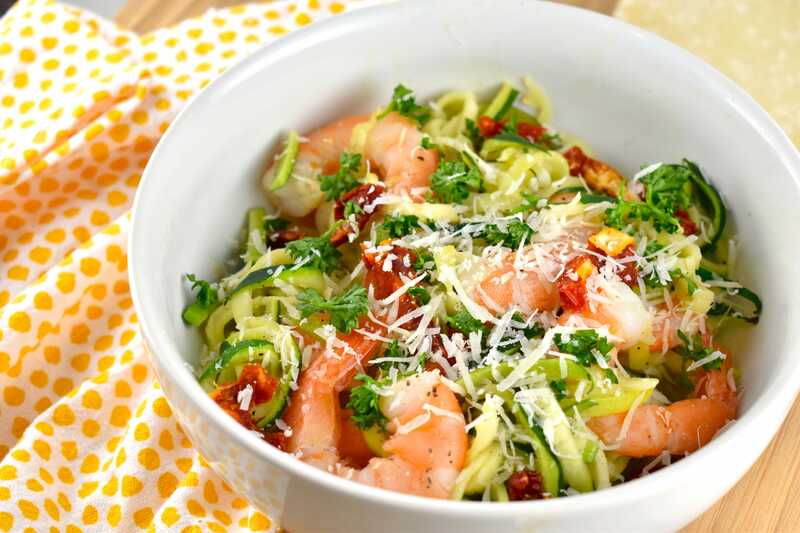 Combining fresh zoodles, and shrimp sauteed in garlic butter was really a no-brainer. I threw in some sun-dried tomatoes, which was DELISH, and added another dimension of flavor. And topped it with a fresh squeeze of lemon and fresh parsley. If you want to add an extra layer of YUM, sprinkle a little grated parmesan cheese on there too! You really just can’t beat a healthy meal that’s made in less than 20 minutes, especially during the warmer weather. Who wants to be slaving away in a hot kitchen when there’s gorgeous weather to enjoy? 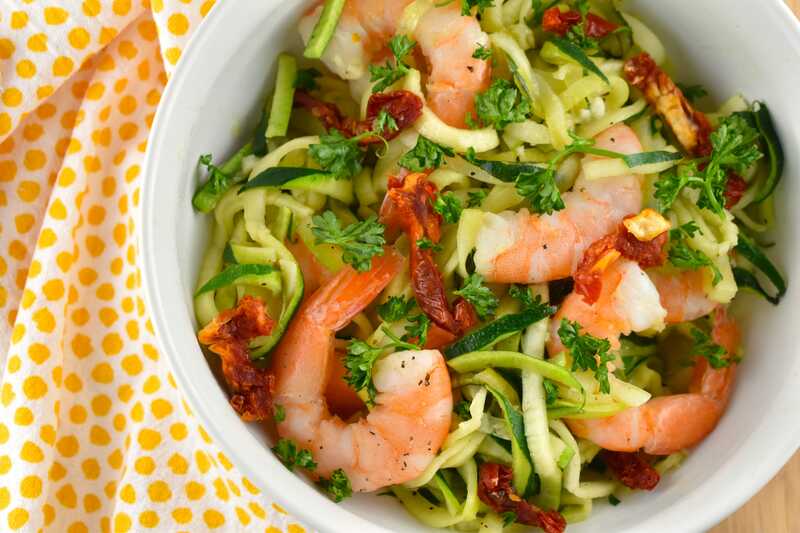 So grab your spiralizer, and give this Garlic Butter Shrimp and Zoodles Recipe a try this week! 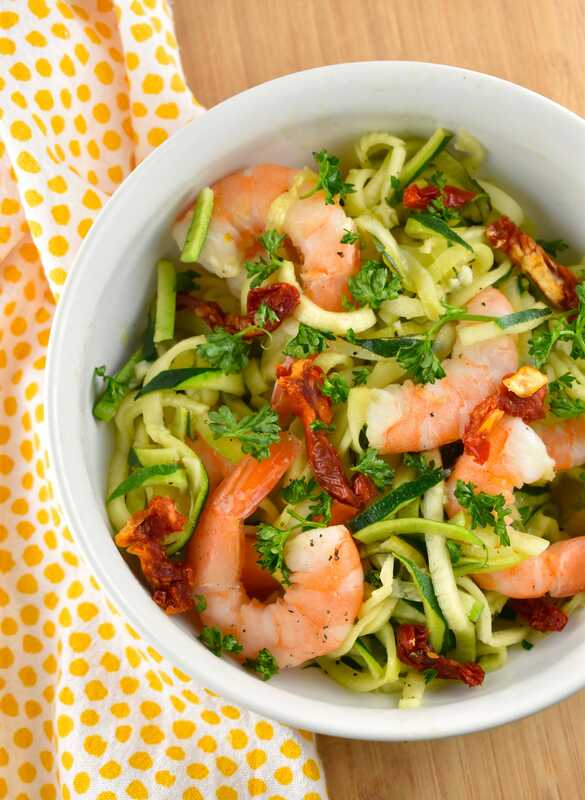 WANT SOME MORE ZUCCHINI NOODLES RECIPES? TRY THESE! A light meal that takes little time and effort, but delivers big on flavor. 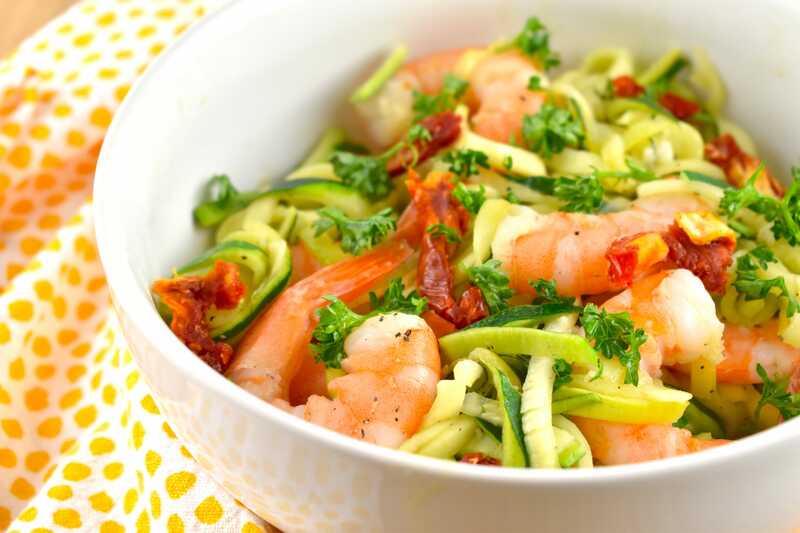 Tender shrimp sauteed in garlic butter and served over sauteed zucchini noodles - perfect for a fast, delicious lunch. Heat butter in a large, non-stick skillet over medium high heat. Add in the shrimp, half of the garlic, salt, and pepper. Cook until shrimp is pink, about 4-5 minutes. Transfer shrimp to a bowl. Add oil and remaining garlic to skillet. 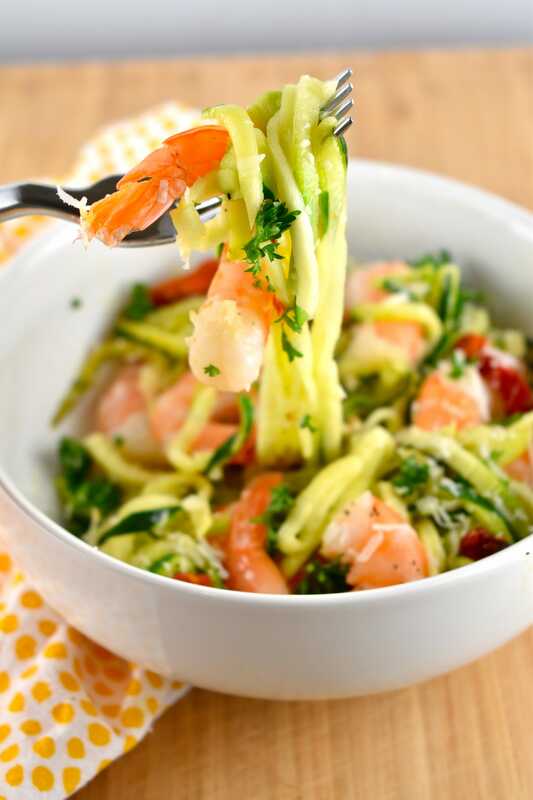 Cook for about 1 minutes, then add in the zucchini noodles, and cook for about 2 minutes, while stirring regularly. Return the shrimp to the pan, and add in the sun-dried tomatoes, and season with additional salt and pepper if desired. Squeeze lemon juice over the dish, and spoon onto serving plates. Garnish with fresh parsley. Yes! Thanks for catching that! I’ve corrected it.